Habitat: The plant is native to western and central Europe. 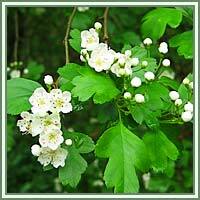 Description: Hawthorn is a deciduous shrub or a small tree growing up to a height of 8 meters. The leaves are pale green with shallow, forward-pointing lobes on each side of the leaf. Tiny white flower buds open from May to June, revealing flowers with five white petals surrounding stamens with bright pink heads. Fruit is small, dark red and apple-like. Parts used: Leaves and berries. 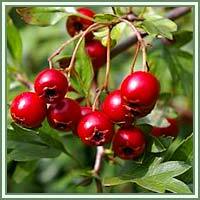 Medicinal use: Hawthorn is considered to be an anti-spasmodic, diuretic and sedative. Widely known as “valerian of the heart”, it has its most beneficial results in treatments of cardiovascular complaints. Hawthorn regulates arterial blood pressure and acts as a heart stimulant (improving the contractions of the heart muscle). It is also a useful diuretic, valuable in treatment of dropsy and in kidney troubles. The flowers and berries are astringent. Used in decoctions, they are helpful in treatment of sore throats.